If you have been reading this blog the last several days you know about the five day fall camping destination series I have doing. Hopefully you have enjoyed reading about the first four destinations I featured which were Vermont, Michigan, North Carolina, and Georgia. For the last destination in the series we are heading all the way across the county to the west coast and the state of Oregon. Did you know Oregon has over 150 state parks (187 if I counted correctly), 53 of which have campsites or overnight lodging? Plus it is also home to Crater Lake National Park. That's a lot of nature to enjoy! To enjoy the best fall colors call their fall foliage hotline at 800.547.5445 or visit them online at TravelLaneCounty.com. There are weekly updates. The fall color season typically starts in mid-September and can last through October but varies depending on the amount of precipitation the area receives. 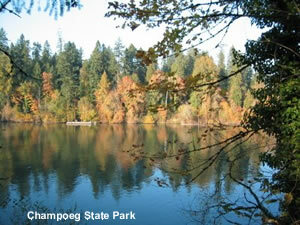 Champoeg State Heritage Area is a great place to watch the oak and ash trees change colors and shed their leaves. It is located on the south bank of the Willamette River near St. Paul and is less than 30 miles from Portland. The park has 12 full hookup campsites, 67 electrical campsites, 6 yurts, 6 cabins, 3 group tent areas, group RV area, group RV camp with meeting hall; 6 walk-in tent sites and a hiker/cyclist camp. So it pretty much has a campsite for every type of camping enthusiast. Pets are welcome. They need to be on leash no longer than 6 feet in most areas of the park but there is a designated off leash area for pets where they can run around and get rid of their excess energy (or at least a little bit of it). The park is open year around although loop A closes from November through March, the group camps are closed October 1 through May 24 and the yurts are going to be closed October 27, 2008 through March 22, 2009 because of A loop restroom construction. 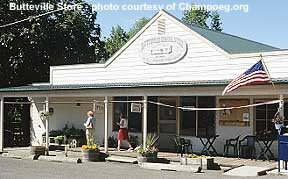 Reservations for Champoeg are available through ReserveAmerica.com. The park is a great place for history buffs. It is where Oregon's first provisional government was formed in 1843 and has museums and historical markers so visitors can learn about what life was like for people who lived there in pioneer times. Also located in the park is the Butteville Store which was founded in 1863 and is considered the oldest operating store in Oregon, although sadly it is closed this time of year (it's open from Memorial Day weekend until the last weekend in September). Other activities to do in the park include walking hiking, biking, fishing, canoeing, playing disc golf or my favorite activity while camping - just relaxing and enjoying the view! If you visit the park on Saturday, October 4, 2008 you can enjoy the Apple Harvest Festival being held there from 1 pm to 4 pm. There will be cider pressing, dutch oven baking, apple ornaments, music, garden produce to purchase, plus fresh-pressed apple cider to drink, yummy apple butter to eat, and desserts from the dutch ovens to gobble up. 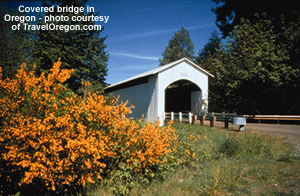 For a great scenic fall drive, take a day trip to Cottage Grove (about 2 hours away) and drive the Cottage Grove Covered Bridge Tour Route where there are 7 covered bridges to view. It's a 20 mile drive but allow a couple hours to enjoy it. For more information including the specific driving route, click here to go to the TravelOregon website. If you enjoy wine, check out some of the wineries in the area. 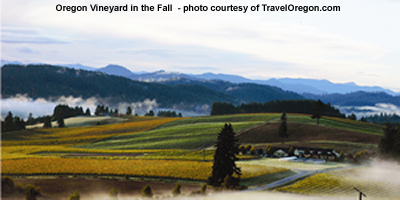 The Williamette Valley (which is where Champoeg is located) is the one of Oregon's major wine growing regions. Click here for information on 16 wineries located in the area. The trip to visit all of them is 37 miles when starting from Eugene, Oregon, but that's a lot of wineries to visit even for me and I'm a wine lover! Bald Peak State Scenic Viewpoint, with a 1,629 foot elevation is nearby and worth a visit just to see the view. Try to go on a clear day because you'll be able to not only see a gorgeous view of the Wilamette Valley but of 5 peaks of the Cascade Mountains - Mt. St. Helens, Mt. Ranier, Mt. Adams, Mt. Hood, and Mt. Jefferson. And, if you are golfing fanatic like my brother-in-law is, there's a Golf Gear Hub course just 5 miles away - the OGA Golf Course near Woodburn, which in addition to being named one of the most affordable golf courses in America by Golf Digest, it's a certified Audubon Cooperative Sanctuary. 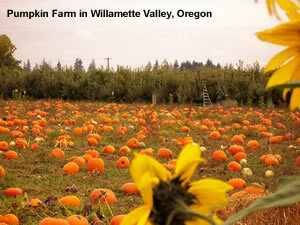 To find more things to see and do in the Willamette Vally in Oregon, such as enjoying area festivals, visiting a pumpkin farm or visiting an apple orchard, check out the TravelOregon website. And, if you a "foodie," autumn is a great time to visit Oregon because it's when Oregon highlights the bounty of the state during Oregon Bounty, October 1 to November 30, 2008. This concludes my fall camping destination series. I sincerely hope you are able to get out and enjoy at least one great fall camping trip. Thanks to the miracles of modern technology, while you are reading this post I am enjoying a 10 day camping trip in Northern, Wisconsin (or at least I hope I'm enjoying it because the weather forecast I checked just before I left on Saturday had a chance of rain all week and cool temperatures). I'll post pictures of the trip, rain or shine, when I get back the second week of October. Happy Fall and Happy Camping!